Art is about progress – Seite 2 – "If you want to communicate, you've got to have good grammar." The ancient Greeks and Romans depicted landscapes and images of gardens as murals, but this fell out of fashion after the fall of the Roman Empire. After a long period during which landscapes were merely a backdrop for religious scenes or portraits, it was the rising Dutch middleclass who rediscovered this genre in ist own right. 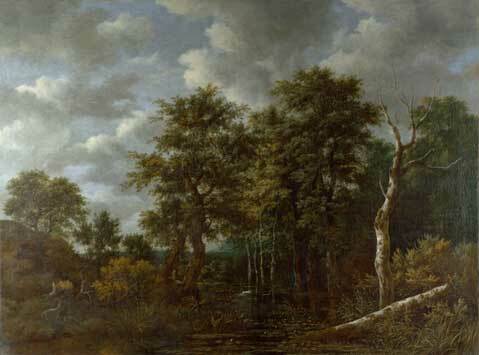 Jacob van Ruisdael (1628-1682) was considered the dutch Golden Age Landscape Artist of all time. 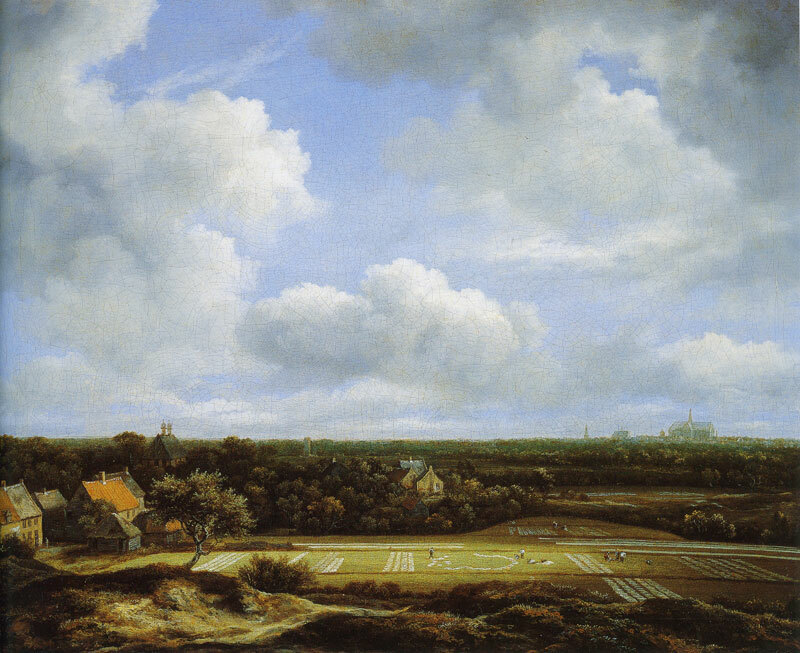 His early works were typical flat dutch landscapes, with low horizons. But from 1665 onwards he introduced imagined or appropriated images into his landscapes, giving them a deeper sense of perspective. I looked at his A Pool surrounded by Trees at the National Gallery on http://www.nationalgallery.org.uk/artists/jacob-van-ruisdael. Quite unlike his earlier work of flat low horizons and dramatic skies, this is a dark and moody landscape with overly minutely worked trees. Apparently he had moved to Bentheim in North Germany in 1650 and this hilly region influenced his style and he introduced ruins, craggy hills, trees, waterfalls and cottages into his paintings. He created paintings of mood by using his imagination, not painting a specific landscape, but creating an imagined romantic one. He was technically a good craftsman and used new methods like impasto to create a certain three dimensional effect. 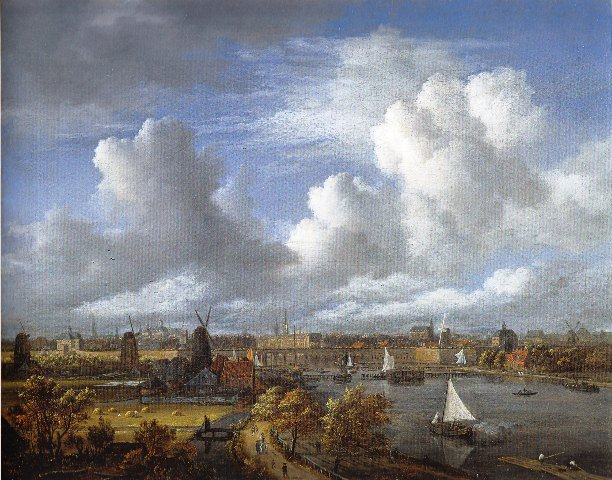 His works were dark and brooding but later, after he returned to dutch terrain in 1656 he returned to his flat landscapes and after the 1650s he used a brighter palette and even introduced more blues in his skies. He was a successful artist and his second career as a surgeon gauranteed a prosperous life. He influenced Meindert Hobbema and later John Constable, who also used the weather to create a certain mood. 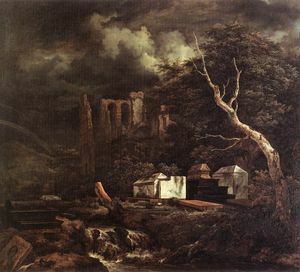 Thomas Gainsborough was an ardent follower who used Ruisdael inspired landscapes as backgrounds. 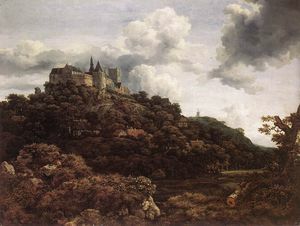 Ruisdael is a predecessor of the Romantic Style of the late 18th century and was admired for his accuracy. His ability to combine nature and the sublime earned him the title of „one of the greatest Old Masters of the 17th century“. I also looked at his two Versions of The Jewish Cemetary at Ouderkerk at the Gemaeldegalerie Alte Meister, Dresden and the Detroit Institute of Arts. Here he refers to the transience of life showing decay, renewal, birth, growth – fresh green against decaying trees, gravestones against rainbows. His aim was not to reproduce a certain view, but he introduced imagined images of ruins, trees etc to add variety and underline the play of light and darks. He later appropriated images of rivers and waterfalls from other masters instead of painting plein air. I find his trees very similar – perhaps he worked according to certain schemes. There are no straight lines in his paintings. I find it very difficult to respond to his later paintings before he returned to the Netherlands. They are certainly well executed but somewhat overly perfect and overworked for my liking. Should I see landscape art as a construction, a figment of my Imagination? I see, interpret, edit what I will include or disregard. I project my imagination, my history, my reflections in my choices – my experiences form my landscape.